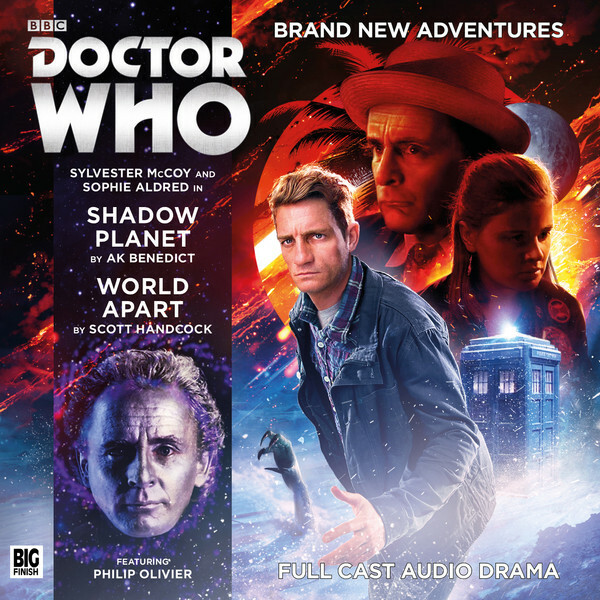 Big Finish’s Doctor Who Monthly Range sequence of double two-part releases comes to a close with ‘Shadow Planet’ and ‘World Apart,’ traversing back upon the Seventh Doctor’s timeline to a time when Hex was still fairly new aboard the TARDIS and still had flirtatious and romantic feelings for Ace. With both stories exploring the intricacies of Ace and Hex as individuals and using the planets as much more than simply generic settings, the secrets and unknown mysteries of these worlds rival those of even the Doctor’s most enigmatic incarnation. AK Benedict’s ‘Shadow Planet’ opens the release with Ace choosing to visit the planet Unity, a planet of psychic potential where one can confront and come to terms with one’s hidden, shadow self. However, as the promised safety of the Unity Corporation breaks down, an engrossing story of hidden motivations and deceit quickly unfolds as the shadows step into the light. Doppelgangers are certainly nothing new to Doctor Who, but the very concept of bringing out the aspects of characters they most try to hide allows for a fascinating duality during a very personal investigation of those involved, Ace and Hex in particular. ‘Shadow Planet’ succeeds in its own right as a technological experiment gone wrong, but the history of both Unity and the Unity Corporation allows for a deeper exploration of the darker side of humanity and repression in the name of progress and profits. With strong performances and some nice twists, ‘Shadow Planet’ is limited only by its brief running time in which the shadows don’t quite get the exploration they need and the conclusion comes off as rather abrupt. Picking up from the intriguing cliffhanger of ‘Shadow Planet’ in which an entire planet mysteriously appears within the vortex, Scott Handcock’s ‘World Apart’ closes out the release. However, the Doctor- whose alien nature has never seemed quite so overt- realizes too late that this is the world of Nirvana, a space-time anomaly with a surface littered with the dead remains of previously-marooned travelers, and his anxiousness to depart before becoming trapped himself leaves Ace and Hex to survive alone on this unwelcome terrain. ‘World Apart’ very much recalls the notion of the Doctor-lite episodes of the Tenth Doctor era on television, here thrusting the focus squarely onto the companions as they cling to any last vestige of hope in the name of survival. Indeed, the majority of this story is essentially a two-hander, and both Sophie Aldred and Philip Olivier rise to the occasion spectacularly, imbuing an incredible range of emotions as optimism, despair, and anger all manifest in turn as the reality of their situation begins to set in and they become the planet’s next intended prey. The more traditional ‘Shadow Planet’ and the more experimental ‘World Apart’ are clearly two very tonally different stories, but both allow for Ace and Hex to explore themselves in uniquely heightened situations. While both tales could benefit from a few more minutes to make their respective conclusions more natural and impactful, the release as a whole is another entertaining success for the two-part Main Range experiment and marks a very welcome return for Philip Olivier and the very human character of Hex.